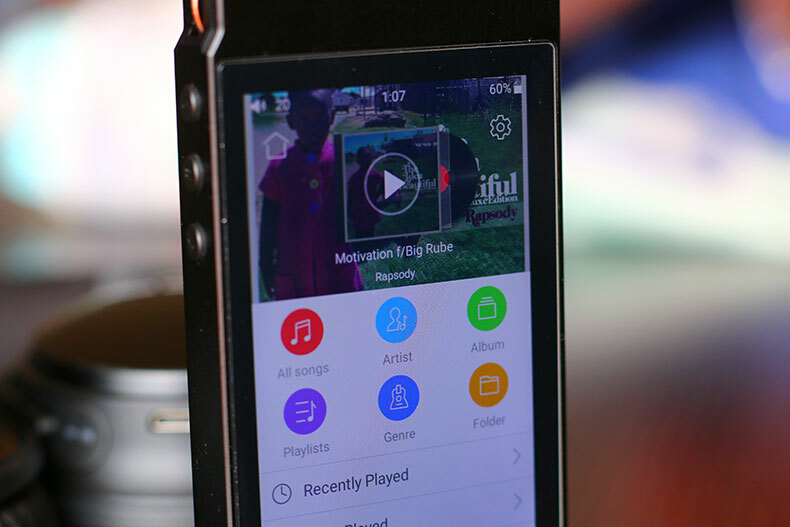 The survival of digital audio players is actually quite extraordinary. Despite the fact that we carry around phones that can do everything, standalone digital audio players continue to sell. 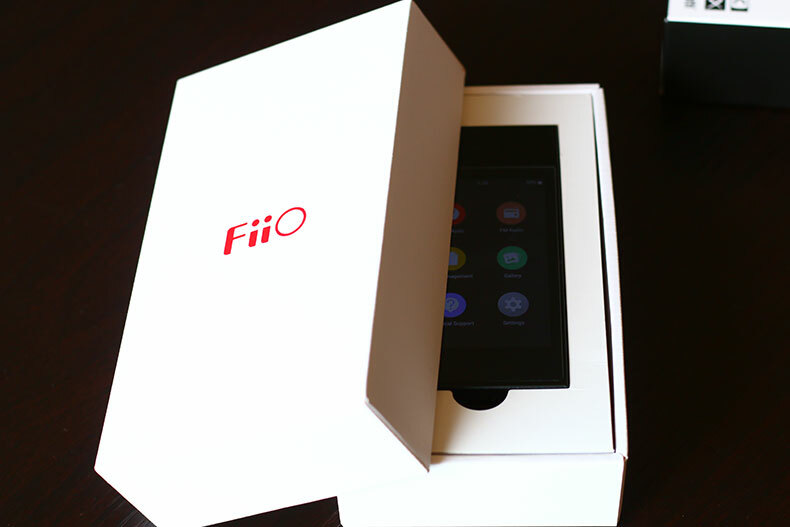 It’s something Chinese manufacturer, FiiO, is counting on with the release of the M7. In this review, we break down the FiiO M7’s sound, design, packaging and accessories, specs and more. To see how it stacks up, see our list of the best digital audio players. The weird thing with digital audio players (DAPs) like the FiiO M7, is that sound quality isn’t the most important thing. It sounds odd, given that the very purpose of these devices is to actually play music, but it’s true. And it’s especially true in this price range, where the differences between DAPs are relatively minimal. That’s not to say the M7 delivers bad sound – far from it. The audio performance is clear and concise, delivering a balanced picture of the music without emphasizing any one particular element. It’s not flashy. It doesn’t shoot up the fireworks and give you eargasms - we didn’t make it up, it’s totally a word. It just presents your music as clearly as it can, and gets out of the way. With a file capability of 24bit / 192kHz, it’s more than capable of taking high-resolution lossless audio, too. 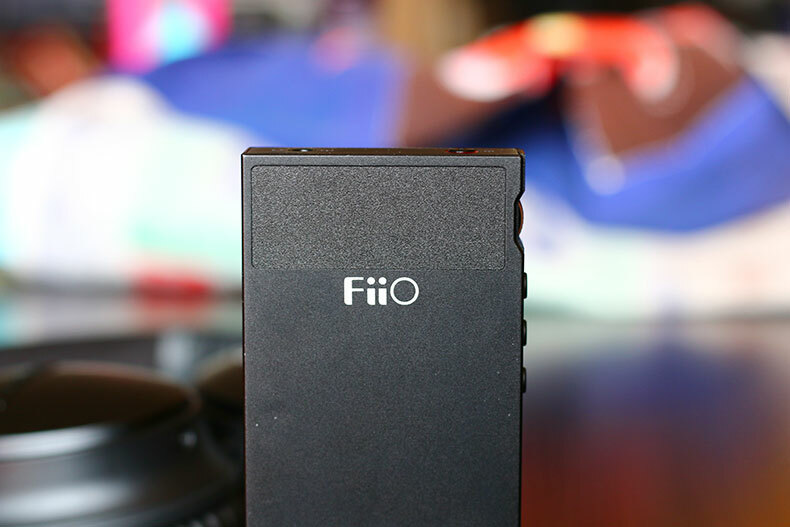 FiiO - pronounced fey-o, if you're interested - have never really deviated from this particular house sound. They don’t have the slavish adherence to neutrality of companies like Beyerdynamic, but you genuinely feel like the player is striving to present your music in the best possible light. That’s no bad thing. If you do want something a little bit different, where the circuitry of the DAP makes itself known a little more, then we recommend something like the iBasso DX90. It’s a little more expensive than the $200 M7, at $379, but has more power and delivers more weight to the low-end. The problem, as we mentioned a couple of paragraphs ago, is that there are minimal audio differences between the M7 and its competitors. 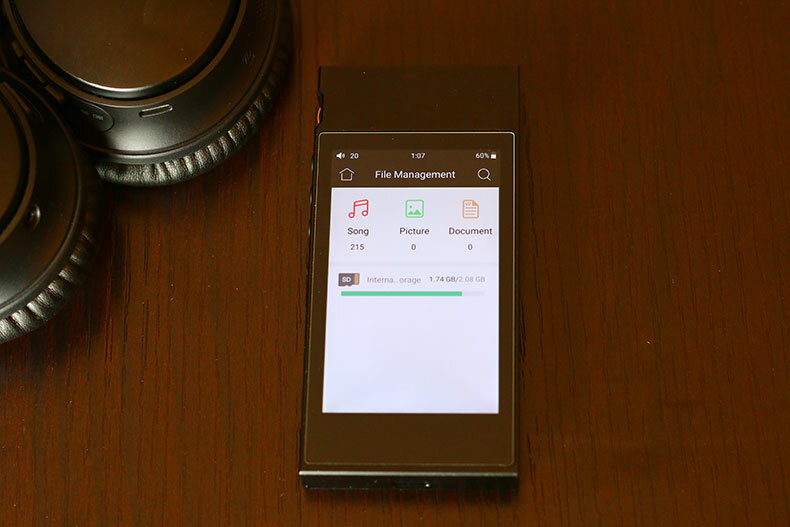 Take the Shanling M0 player, which costs $129 to the M7’s $200. While there are a few differences in features, which we’ll go into below, the overall sound quality is virtually identical. Yes, they use different DAC chips (Digital-to-Analog Converters, which convert the 1s and 0s of your audio file into actual, audible music). And yes, there probably are a few small differences if you listened closely. But really, we’re talking very small changes here. While the M7 is an excellent player, with plenty to recommend it, it doesn’t deliver the audio knockout blow that’s required to recommend it over its cheaper siblings. If you want a significant upgrade in sound, and are willing to pay for even more razor-sharp clarity, then we suggest sticking with FiiO and their X7 Mark II. It’s a bit old now, but it still has some excellent tricks, including interchangeable amp modules that let you mess around with the sound quality. It costs $650, compared to the newer M7’s $200. If we’re being honest, the M7 has better functionality and a better operating system, but the old X7 has far better sound quality. The M7 rides the wave of a new trend we’re seeing in the audio world: the inclusion of LDAC. This is a type of Bluetooth, invented by Sony, which transmits data much higher rates. That means higher quality sound (obviously). The downside is that the technology is still in its infancy, and hasn’t been widely adopted. Still, it’s good to have, and both it and the aptX Bluetooth work very well. We had no issues pairing the M7 with our Bose Quietcomfort 35 II headphones (full review here), and on a recent international trip, the combination of the Bose and the M7 was an absolute joy. Noise-canceling, plus high-res Bluetooth, plus being able to save our phone battery, equals happy Master Switch writer. The player even includes an FM radio, and it can handle DSD audio. And while it may not make huge leaps beyond its cheaper competitors, as mentioned above, it doesn’t take anything off the table. No matter what sound source or file type you’re using, no matter whether you’re Bluetooth or wired, things sound assured and controlled. One important note to bear in mind: this player does not include support for Wi-Fi, or streaming services like Tidal and Spotify. While that’s definitely an annoyance, and something a smartphone would not have a problem with, it’s not something we can really fault the M7 for. That’s because virtually no other players – certainly none in this price range – offer support for those services. If we’re wrong about this, please let us know in the comments. Then again, you shouldn’t buy a DAP with the expectation of using streaming services. Actual digital audio files will be required. Hey, we don’t make the rules. The M7 looks amazing - truly. It's a slim black slab, with subtle controls and a recessed volume wheel, that's both attractive and intuitive to use. Despite the sharp edges, it feels good in the hand. And its light weight - a little over 4oz – means that it isn't going to weigh down your pocket. 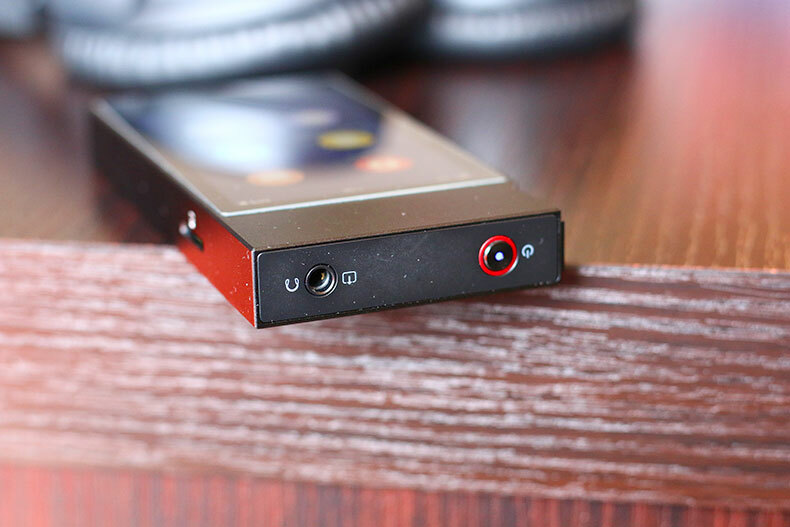 It’s a design ethos that shares a lot of DNA with one of our favourite portable amps at the moment, another FiiO product called the Q5 (full review here). They both have a similar look and feel - although, the M7 has one significant advantage in its giant touchscreen. While this isn’t end to end, like a modern iPhone, it’s more than big enough, measuring 2” x 3”. It’s also gloriously clear, displaying your album art in full color, and it was a total joy to use. 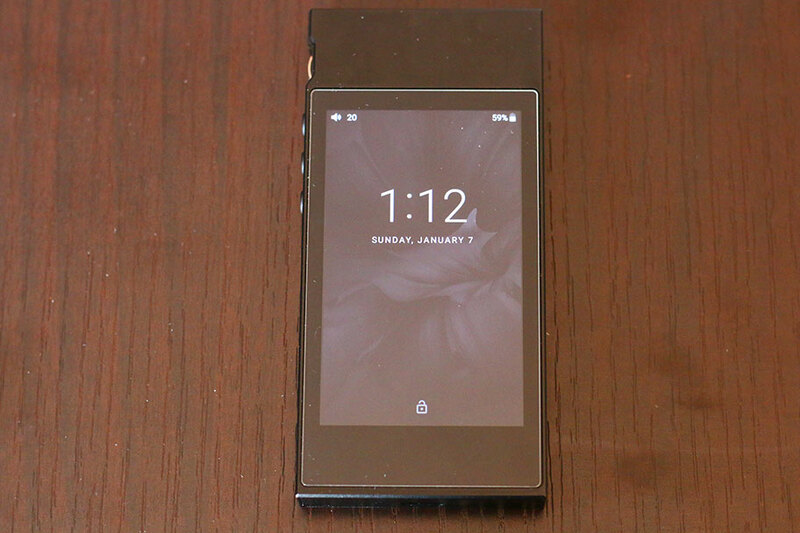 It’s much better than the smaller touchscreen of the previously-mentioned Shanling M0. The external controls are very minimal. The volume wheel is knurled for grip, and is easy to find and operate – as are the three function buttons below it. It’s the touchscreen you’ll be using the most, and it would mean nothing if the operating system wasn’t up to scratch. Fortunately, it very much is. The M7 runs off a modified Android OS, which is easy-to-use. While it would be nice to have slightly more logical swipe gestures – you swipe from left to right on the top part of the screen to go back to the previous menu, for instance – it’s a very minor thing. And getting the player to scan the tracks you load is simplicity itself, as the computer scrapes meta data to display coherent track names and album art. Font is clear and easy to read, too, and there are enough customization options and themes to make it easy to fine-tune things. If there was ever an advertisement for spending just a touch more on a DAP, it’s here: the ease of use, and the operating system. Compare this to the absolute disaster that was the Dodocool DA106 (full review here). Sure, it only cost about $50. But it was awful, and a big reason for that was its operating system. One of the unique features of the M7 is that it offers playback through USB-C headphones, which is something unique among the DAPs we’ve tested. It sounds nifty, but like the inclusion of LDAC Bluetooth, it’s probably going to be used by only a small handful of people. That’s because there simply aren’t enough USB-C headphones around at the moment. The Xiaomi Mi ($56) are probably the best of the bunch at the moment, and honestly, we'd just advise skipping this entirely unless you have no other option. Thank us later. The M7 comes with a slot for a microSD card, as well as 2GB of internal memory. It sounds like a lot, but compared to other players in its price range, it really isn’t. As an example, the Cowon M2 ($166to the M7’s $200) comes with 16GB of storage. That’s a bit of a black mark for the M7, and it’s frustrating that such a good player is let down by such a tiny internal memory system. It definitely isn’t a deal breaker, but it’s something to bear in mind. One big positive for the M7 is the battery life. At moderate volume, we got around 22 hours of battery while wired, and around 25 on Bluetooth. That’s more than enough for a transatlantic flight, and definitely enough for multiple short-haul ones. It will certainly last you a few commutes without breaking a sweat. Take a look at the best wireless headphones of this year: most of them have a battery life of under 20 hours, meaning your headphones will more than likely need charging before your player will. 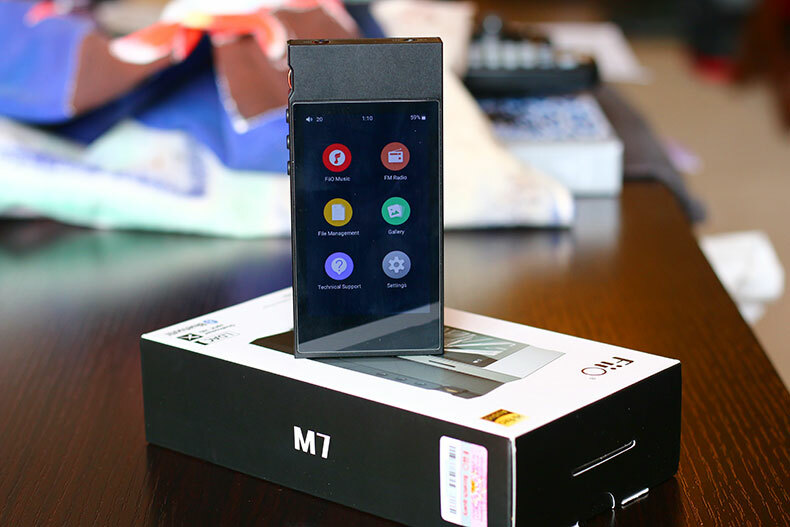 Both the accessories and packaging of the M7 are minimal. The box it comes in is sleek enough: a smooth white number with a cardboard lid that slides right off. It’s nice to have, but can be disposed of straight away. There are only two accessories that come with the player: a very short USB data/charging cable, and a plastic case. We’ll be honest: the plastic case feels a little bit useless. While it definitely protects the player, it doesn’t actually do anything to protect the screen itself - if you drop it face down, you’ve got problems. No, we didn’t actually test this. 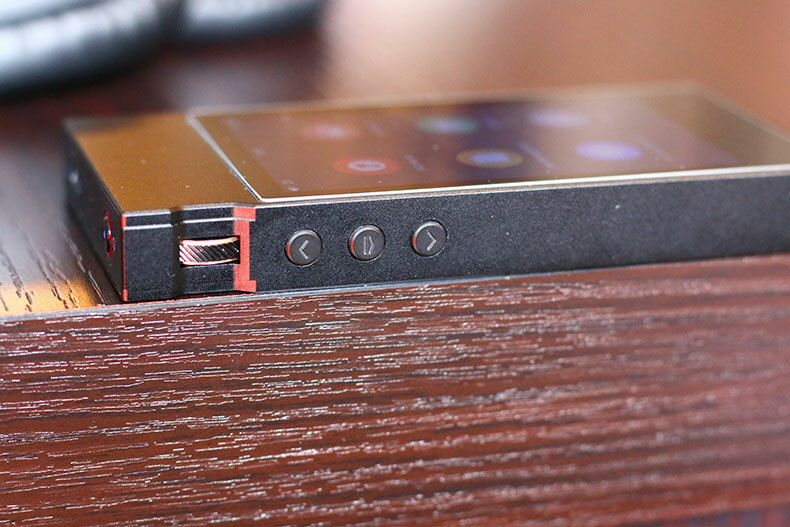 And, as far as we are aware, FiiO don’t offer screen protectors. So, be very careful when handling the M7. Somehow, we don’t think your local phone repair store is going to know what to do here. 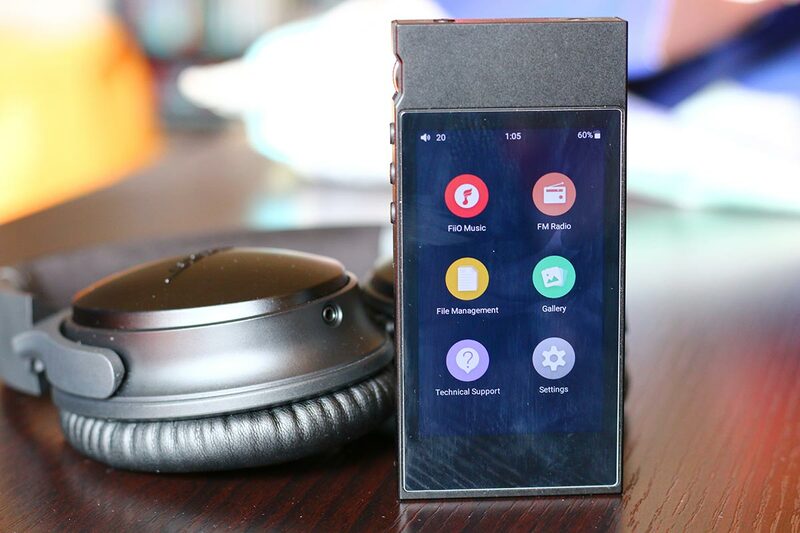 The sound quality of the FiiO M7 is clear and precise, presenting your music in a balanced way. The design and build quality of the player are top-notch. The M7’s modified Android operating system – and its incredible touchscreen – are a joy to use. The M7’s LDAC and USB-C functionality feel tacked-on, and even a little bit pointless. There’s limited internal storage available, although you can expand up to 512GB with the microSD card slot. The M7 suffers in comparison to its competitors, which offer similar functionality at an often cheaper price. The DAP market is super crowded, especially in the sub-$500 range. The M7 is going up against plenty of challenges, and it doesn’t always do enough to differentiate itself. 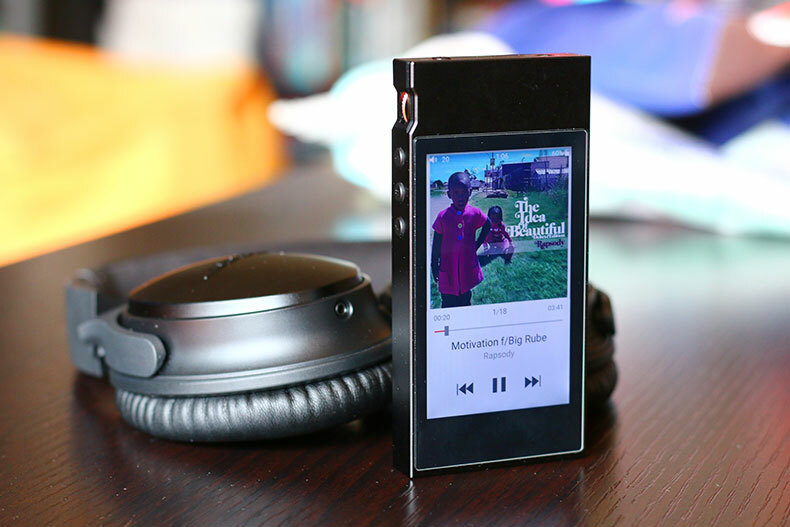 Take the Shanling M0. Sure, it doesn’t have any internal storage, and has a much smaller touchscreen. But it’s also cheaper ($110 versus $200 for the M7), and has similar specs. In some cases, it even surpasses the M7; its SNR (Signal-to-Noise Ratio) is 118dB, compared to 117db for the M7. It’s not a huge difference – as we mentioned before, the sound quality of these two models is virtually identical – but it certainly undercuts the M7 in many key categories. For the record: we prefer the M7, which we think is a lot more fun to use, thanks to its touchscreen. But if you’re on a budget, then there’s no competition. The $379 iBasso DX90 Is another alternative. It’s body and operating system are old as time, with clunky buttons that revive a Walkman from the 1990s. Compared to the usability of the M7, the latter wipes the floor with it. What the DX90 loses in style, it more than makes up for in substance. It delivers rich, powerful, soaring sound quality that takes your raw audio files and launches them into orbit. It might be a little bit of a pain to use, but it’s great fun when you’re actually listening to it. You also get 8GB of internal memory, compared to 2GB for the M7. 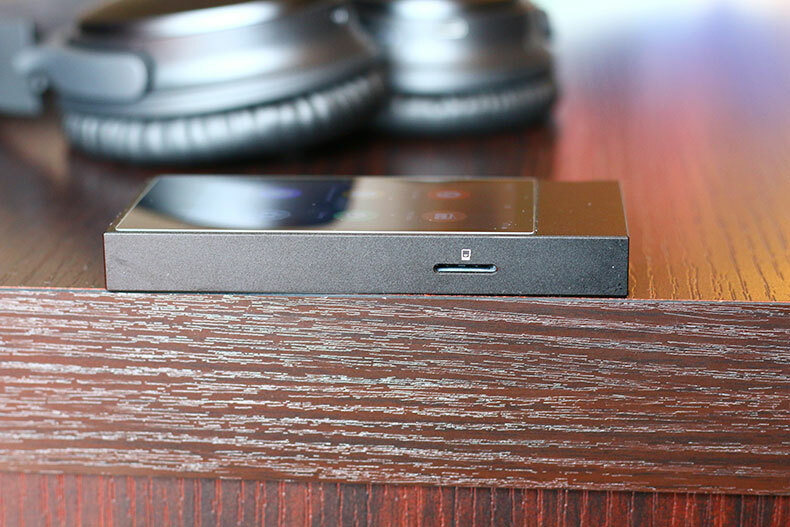 Cowon are a brand that doesn’t have the footprint FiiO does, but they’re gaining ground. The Cowon M2 isn’t the most expensive player they offer, but it’s definitely one of the best. The M7 definitely beats it on sound quality – no question there – but the $166 M2 has several other things going for it. It has a magnificent touchscreen that, while not significantly bigger than the M7’s, actually looks clearer. It can also play video, and has a staggering 90 hours of battery life. That’s enough for around ten flights to Mexico and back. Coincidentally, we don’t know why FiiO, Cowon, and Shanling all use the suffix M for their players. It must be a marketing thing. 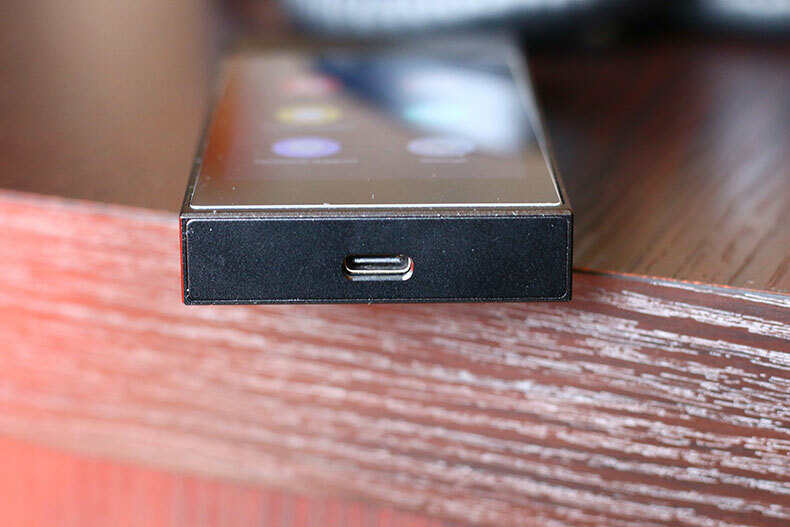 Since this review was written, FiiO have released a newer version in the M line: the FiiO M9. It costs $100 more than the M7, and while that might seem steep, there are some serious changes. Not only has the design been overhauled - the screen is larger, with no top bezel - but the internals have been given a reworking, too. There are twin DACs now, improving sound quality even further, as well as full Wi-Fi streaming. That means Tidal, Spotify, and the like are all accessible - something the M7 doesn't have. We'd definitely recommend this newer model if you want advanced features - although beware, it has less battery life than the M7 did, at ten hours. Here’s a question for you. How much are you willing to put up with for great sound? When you’re buying audio gear, do you go for stuff that is easy to use, that you will never have to think about, and which will become second nature to operate?